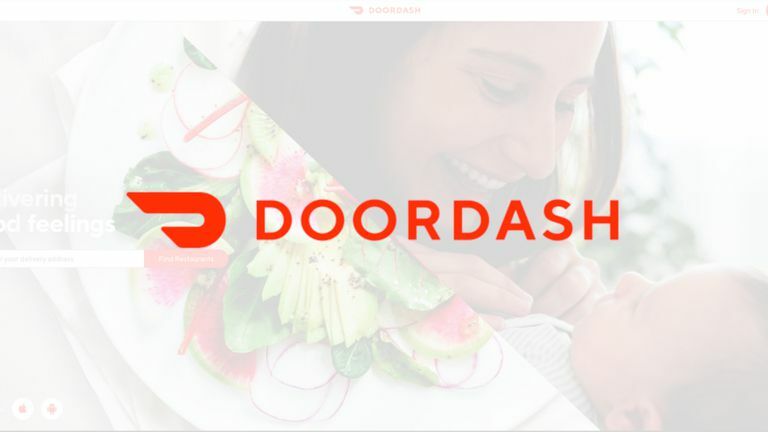 Doordash delivers food your home or office from restaurants that don't necessarily serve your area. The service brings many of the conveniences, like order tracking and online payments with tipping, that you'd find from larger chains to even the smallest local eateries. That's why Doordash might be the best way to try new food in your neighborhood. Doordash uses a convenient unified web interface where you can order from a wide array of local restaurants from one account. The company can make door-to-door deliveries from most restaurants that offer take-out. After you place an order, a Dasher picks it up and delivers it to your door. Hungry users can access the service through its website or by using the mobile app, which is available for both iOS and Android smartphones. The Doordash website will take you to the registration form. Fill in the registration form or connect your Facebook or Google account. Next, enter the address that you want delivery to in the search box, and hit search. Doordash then displays a list of restaurants in the area that they can pick up from and deliver to your address. The results at the top of the page are often advertisements for national chains that have partnered with Doordash. Scroll down for a complete list. Doordash presents your options in a grid, with the restaurant's logo, name, what they serve, their delivery charge, and how long your order will take to arrive. Click on a listing to select your restaurant. At the top of each menu, is more information including the restaurant's hours of operation, its star rating, distance from your address, and delivery time. Below that, the menu is broken down into categories with links for easy navigation. The top sections feature the most popular items. Scroll through your restaurant's menu and click the items you would like to order. Some items have options to customize your order or add special instructions. Then, choose how many you want and click Add to Cart. Then you'll see the item you selected in your cart on the right side of the screen with your current total on top. After you've added everything you want to order, click Checkout. Now you'll see your order summary on both the bottom and right side of the page, with a complete breakdown of your items and the total. You can schedule the delivery for a specific time or have the food delivered as soon as it's ready. Next click Add a payment card. Enter the details; you can save the card to your account for later use. In the order summary on the right, there's a space to add a tip for your Dasher (the delivery person), which gets charged to your card. Check that your delivery address is correct and then click Place Order. Now you'll see a screen with a large map, displaying both your location and the restaurant. To the left is the estimated delivery time and a tracker that updates in real time to show the progress of the order. After your order arrives, the completed order page allows you to review both the restaurant and the Dasher who delivered your food. When you're ready to order again, sign in to your account and start the process over. So, who delivers for Doordash? They're called Dashers, and they're contractors who use their vehicles to make deliveries. It works much like Uber or Lyft, but for food (like Uber Eats). You can sign up to be a Dasher on Doordash's website. They'll review your application, and if you're approved, you can start accepting orders via the Dasher app. Dashers earn the tips that customers leave when placing your orders and are paid directly by Doordash. Being a Dasher is a decent side gig or part-time job since they can set their schedules and choose which deliveries to accept.